Synopsis: In many ways, Rachel and Alicia are like any sisters. But Rachel knows her sister is very different, and very special. She has Down syndrome. Alicia May likes dogs and horses, is curious about ladybugs and dragonflies, talks to animals at the zoo and calls them funny names, loves to paint her nails, is friendly and gives good hugs. Sometimes Alicia May is annoying and embarrassing and Rachel doesn’t want to be around her. But, when boys on the bus tease Alicia May, Rachel is the first to stand up for her sister. Why I like this story: This is a heartwarming story for siblings of children with Down’s syndrome. Nancy Tupper Ling based the story on the lives of two real sisters she’s close friends with. 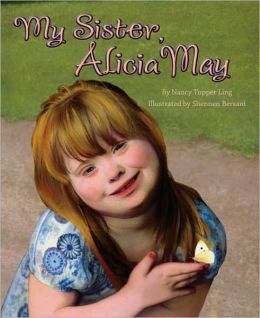 It is a compassionate story that offers a peek into the daily life of a child with special needs and the complexities for the family. I like that the story is told from Rachel’s viewpoint. Shennen Bersani’s illustrations are colorful pastels and almost photographic in their detail. Look at the pictures of the girls at the end of the book as she has really captured their features and personalities. Check out Nancy Tupper Ling’s website. Resources: Contact the National Down Syndrome Society for more information on resources, success stories, transition tool kits, caring for your family and advocacy. Elizabeth Verdick & Elizabeth Reeve, M.D. This survival guide is meant for a parent and child to read together so the material can be discussed and questions answered. It is an informative and upbeat book for children who have been diagnosed within the autism spectrum to learn about themselves and their disorder, and to find coping strategies to deal with daily challenges. Beginning with a description of ASD and its many symptoms, this guide includes information about relationships with family members, making friends at school, community involvement, changing schools, feelings, communications, body language, bullying, playing, relaxation, sleep and personal hygiene. What I like about this book: Elizabeth Verdick and Elizabeth Reeve, M.D., are both parents of children with autism and offer a unique perspective. The guide has a wonderful balance of text, examples, tips from famous people with autism, colorful and lively illustrations, and stories from kids with ASD. The book is a great resource packed with tools that kids can use to navigate new daily experiences, find a calm-down space, talk about a new emotion (I am upset), organize schoolwork and schedules, and eat a balanced diet. I don’t recommend parents read the book from beginning to end with a child. It is a resource that can be used when they need help. The chapters are well-marked and topics easily located. You will find that this guide will be very handy as your child enters many new developmental stages. April is National Autism Awareness Month. According to a report released March 29 by the federal Centers for Disease Control and Prevention, the estimated number of U.S. autistic kids has skyrocketed by 78 percent since 2000. Now, one in 88 American kids has autism, according to the new figures. Among boys, it’s one in 54. The big question is “why?” One expert said, “better diagnosis, broader diagnosis, better awareness, and roughly 50 percent of ‘We don’t know’.” Another advocate said, “we have an epidemic of autism in the United States.” For more information, visit Autism Speaks. What a fascinating month to share interesting stories of the heroes of autism and the daunting work that goes into helping each child transform his/her life. Although I am not reviewing a book in this blog, I want to share with you a remarkable story of a teenager. According to the organization Autism Speaks, 1 in 110 children are diagnosed within the autism spectrum, making it the more common than childhood cancer, diabetes and HIV. One in 70 children diagnosed are boys. In the U.S. alone, there are 1.5 million people, and tens of millions worldwide. Thus, the reason I am going to feature a remarkable teenaged girl who has autism — Carly Fleischmann. Carly, a twin, was diagnosed with autism at age three. She has never spoken and she spent her life feeling trapped in her body. One day she surprised her family and typed out three simple words on the keyboard — help hurt tooth. She was sick and asking for help. Learning to type on the keyboard unlocked her world. The rest is history. Carly was featured on a segment about inspirational teens, on CBS The Talk, April 15, with Holly Robinson Peete. She has been featured on 20/20, The Today Show, ABC and the Larry King Show. I hope you enjoy this remarkable video. In the next decade, 500,000 children with autism will reach adulthood and it will become even more important that they are prepared for life, and society is there to embrace their transition. Children within the autism spectrum are very intelligent and have unique talents in the fields of art, music, science, computers, and math. On Friday, April 22, at 2 p.m., The Talk will air the last of its series on autism. They will focus on the autistic children transitioning to adulthood. Autism Speaks has a special “Transition Tool Kit” on its website. Since we are midway through celebrating Worldwide Autism Awareness Month, I want to focus on important individuals within the autism spectrum who have been successful in life. I discovered Different Like Me: My Book of Autism Heroes, by Jennifer Elder, who has a son with autism. This book is a chapter book for children, ages 8-12, with illustrations by Marc Thomas. Quinn, is an eight-year-old boy, who likes baseball, dolphins and Egypt. And, he has autism. He’s shy, doesn’t easily make friends, and feels different from other children. One day he discovers that when he draws, other kids in his class gather around him. For Quinn, drawing helps him find his niche at school. What I like about this book, is that it really focuses on differences in people. Elder creates short easy-to-read portraits of the lives of each famous person. She shares their journey from childhood to adulthood to their achievements. Each found a way to fit in through a talent as did Quinn. Each famous person is a role model of what a child can do. It is a book about what the human spirit can do if given the freedom to fly. This is a book is a beautiful resource for children with autism, their families, friends and teachers. I want to mention again, that Friday, April 15, at 2 p.m. EDT, the daily CBS, The Talk, will feature a discussion with inspirational teens who are autistic. They have done a segment every Friday to promote Worldwide Autism Awareness Month. Yesterday I reviewed My Brother Charlie, and talked about the HollyRod Foundation, launched by Holly Robinson Peete and Rodney Peete. On Friday, the weekday CBS Show, The Talk, focused on fathers with autistic children. Rodney, actor Joe Mantegna, and single dad Jimmy Smith, shared their experiences in a roundtable discussion led by Holly. After watching the program, and reading Rodney’s book, Not My Boy!, it felt significant to discuss the impact on dads, who sometimes feel left out of the equation. Joe Mantegna has a 23-year-old daughter, Mia, who graduated with honors. Joe said “he was relieved the first day of school when Mia’s teacher, who had an autistic child, welcomed her with love and talked to the classroom about how they all would help her.” Jimmy Smith said he woke up one day when he realized that his son had an excellent memory and wanted to learn. All three men said they were just glad to talk with other dads! One day Rodney had a pivotal moment when he took R.J. to the therapist. “I got down on the floor and tried to play with R.J., and there was no connection,” he said. “The therapist showed me how he connected with R.J., and within minutes I saw my son laughing and talking. It broke my heart — a stranger was connecting with my son. In that moment I knew I had to turn things around.” He realized that the entire family needed to be on the same page. Today R.J. has gone beyond expectations and plays soccer, with his dad there cheering him on. Not My Boy! should be required reading for all father’s who have children who fall under the autism spectrum. It is a powerful look at Rodney’s own inner journey with his son’s autism. It offers a message of hope and inspiration for families. Next Friday, Apr. 15, at 2 p.m. EDT, The Talk, will feature inspirational teenagers who are autistic. Visit elizabethannewrites and read reviews of two excellent young adult books that honor Autism Awareness Month.